This Masonic Flamberge Dagger is beautiful and intriguing, full of character and detail. The stainless steel blade of this dagger features a unique wave-bladed design, which helps it to stand out from ordinary display pieces. 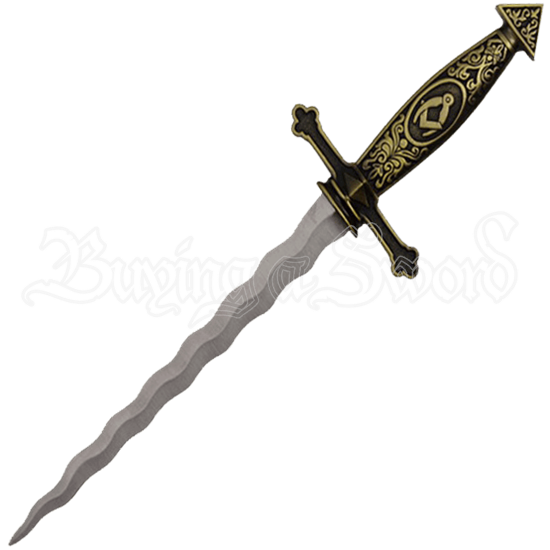 This collectible dagger features an amazing amount of detail on the hilt and pommel, which is shaped like triangle. Gold fittings look great with the silver color of the blade. The included scabbard is blue with gold fittings that match those on the dagger. This unique dagger is sure to be a talking point with friends and family when they see it proudly displayed in your collection.